The Walk Behind electric pallet trucks help maximise your productivity with better performance and agility. The compact dimensions, low effort operation and low tiller arm mounting all contribute to the lower operator fatigue. The trucks are made for enhanced traction and stability and have a super sturdy construction for demanding applications. 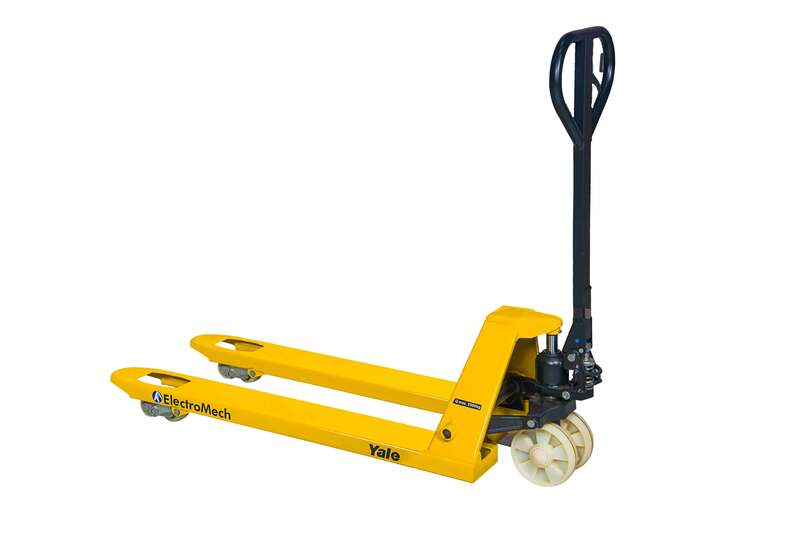 The electric pallet trucks are made with the powerful Yale DC SEM technology with the state-of the traction motor which gives unparalleled performance, acceleration and travel speed. The maintenance free design is combined with the automatic release braking and smooth direction shifts which all give greater performance, increase productivity and improve reliability with fewer moving parts. These trucks also come equipped with adjustable performance setting which allow you to optimise the acceleration, travel speeds and braking for your specific application. The electric pallet trucks have excellent manoeuvrability and control which is in part due to the low mounted tiller arms which reduce steering effort. The adjustable braking can be controlled by the butterfly buttons which are easily controlled by the operator, slowing the moment the butterfly button is released. The pallet trucks also have optimised controls like advanced tiller head, comfortable angled grips, large butterfly buttons and keyboard like fingertip controls, all of which maximised controllability and operator productivity. The pallet trucks offer customers a low cost of ownership which minimises repair costs and provides maximum uptime. These trucks give easy access to key components and have a part commonality with other warehousing parts which reduce costs and service requirements. The durable pull rod design provides smooth lifting and lowering and protects grounding of forks. The pull rods also make the pallet truck more resistant to bowing and bending and prevents ovalizing of axle support. This reduces the wear and tear and increases long term dependability. The design of the pallet trucks allows for service personnel to get easy access to all key components reducing the time needed for servicing. The availability of parts and the commonality with other Yale warehousing products makes the down time lesser and minimises repair costs. The electric pallet trucks have great performance which is combined with excellent manoeuvrability. These trucks come equipped with several battery options which increase uptime and productivity and reduce frequency of battery change needed. The sturdy compact design helps the ride on trucks enhance productivity and dependability. Hand pallet trucks deliver exceptional durability, functionality and serviceability at competitive pricing. These trucks can be delivered in different variations and configurations. Application specific the range includes - low profile models, stainless steel, galvanized and weigh scale. Features like industrial strength steel, reinforced bulkhead base, handle base to prevent bending, reinforcement bars make our hand pallet trucks durable and can offer a long, trouble free service life. Hand pallet trucks offer the highest degree of functionality while quickly reaching the maximum height through 200 degree turning pivot. Helper rollers allow easy pallet entry and exit whereas the adjustable push rods to level forks and hand or foot release design mean absolute ease of operation. Articulating axle provides excellent maneuverability with entry and 3 exit rollers eliminating the need for “pushing” and “pulling”. We offer large, easily serviceable pump assembly which is easy to maintain. The custom handle pin design allows quick reinforcement. The heavy steel design with easy access to push rods and all pivot points with oil-lite bushings or grease/oil fittings add to the durability and ease of operation of your hand pallet truck.